Harley-Davidson, Inc. (HOG) stock has been crushed over the last three months losing more than 60% of its value. The iconic motorcycle company is dealing with a challenging economic environment and consumers who are less willing to make major expenditures, especially on nonessential purchases. 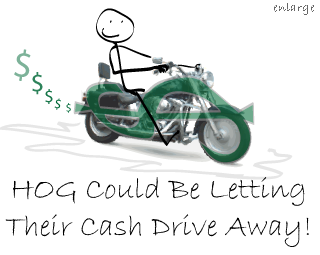 When evaluating HOG, it is easy to see that the stock is at very depressed levels compared to its historical norms; however, it may be some time before Harley-Davidson’s underlying fundamentals levitate undervalued HOG shares. First of all, we rate HOG Undervalued because its price has fallen very rapidly. Even though the company’s fundamentals, such as sales and earnings, are showing weakness, they have not deteriorated so much as to warrant this big of a price drop. When looking at the stock from a long-term perspective, in this case 10 years, HOG is selling well below historically normal valuation ranges. For example, over the last ten years the stock has normally traded in a price-to-sales range of 1.95x to 3.2x but, as of the most recent sales results, the stock is trading at just 0.7x. Furthermore, the company has normally traded in the price-to-cash flow range of 9.8x to 16.4x yet its current price-to-cash flow is only 3.9x. Rarely do we find these metrics at such depressed levels compared to historical precedents, even in this market! Harley-Davidson pays a substantial dividend (eight percent plus yield) and that dividend appears safe for now. Also, Harley-Davidson has recently reaffirmed its earnings estimate for the full fiscal year to come in at just above $3.00 per share. So, the company is trading at a P/E of just over five. It is easy to see why the company is buying back stock, HOG is extremely cheap! However, it is always to important to resist looking at valuations in a vacuum. After a little bit of digging, we found sufficient reason to be cautious in recommending this stock. Now, we know that in the last quarter the company reported $6.3 million in write downs for loan defaults. We do not want to overreact to a few million dollars in loan losses because, in the grand scheme of things, this is relatively small amount. However, if there is anything that we have learned from the misery of the last year, it is that credit crises of this sort take time to fully unwind. There are far too many good companies with solid fundamentals that truly warrant our Undervalued rating and that do not have this potential liability for us to recommend HOG. When you combine the potential credit issues confronting HOG and the fact that consumer spending is expected to be weak for at least the next two quarters, we do not recommend buying HOG shares right now. Although the valuation of HOG looks quite appealing based on what the market has traditionally paid for the shares, we think that there is ample reason to be cautious. You may be able to buy these shares even lower in the coming quarters.